Every classroom or preschool hall will benefit from cubby storage units. Now you have a spot for toddler Cot Sheets, art off the Drying Racks, and every Block or toy a child brings in. 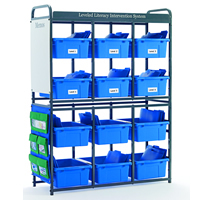 Choose from fold and lock cubby storage units and classroom supplies organizers. Take advantage of the cubby bins and trays and cubby storage tubs for small items that could get lost. If you need a way to move supplies around and a Teacher Cart just won�t cut it, try a mobile cubby storage unit to get supplies around!